First thing this morning, Steve and I headed back south, again with Top Pot donuts, for my great return. We distributed the wealth to some very happy hikers. Then I headed back up the highway to the trail junction, while Steve headed to Prosser for some well-deserved wine tasting. The goal for today was just 8 miles, very mellow, with only 1300 feet of gain. I’ve put together a bailout plan for White to Chinook, including side trails every 10 miles (and 20 miles between Chinook and Snoqualmie). My plan is to do low mileage and get plenty of rest. And today’s hike was pretty flat, full of delightful little lakes. They’re so small that very few of them have names. I spent tonight at Pipe Lake, a pretty little place with water warm and clear enough for swimming. I got to the lake about 4, and quickly set up camp. I was feeling pretty bummed about not going fast, and was missing the family. 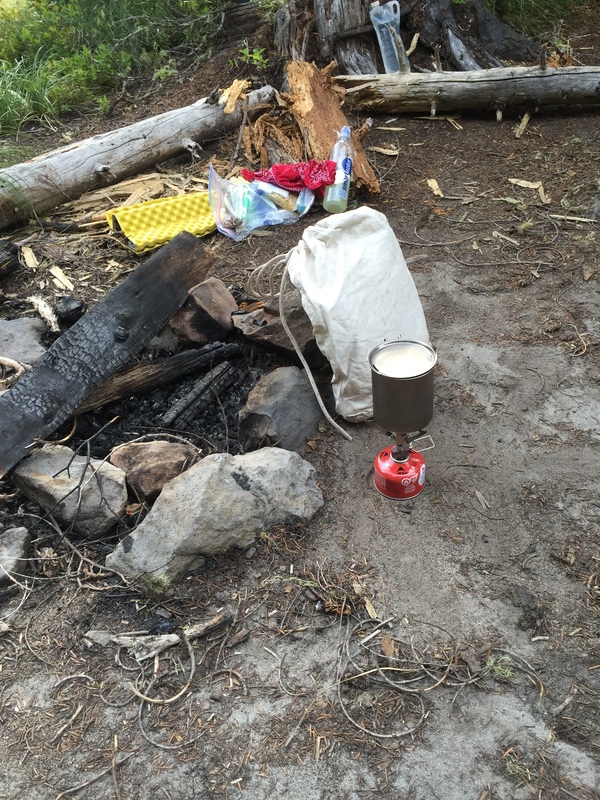 So I decided to document a standard campsite. In front is my Ursack, a bearproof Spectra bag lined with an odorproof OPSak zip top bag. Together, these hold about five days worth of food. The stove is a 2 oz. MSR Microrocket, and the pot is a Snow Peak 700 ml titanium with a lid. That, plus a long handled spoon, is my entire cook kit, and everything except the spoon fits into the pot. In the back is my sit pad, a couple of ziplocs containing my day’s food, a bandana for spills and for use as a hot pad, and my clean water/drinks bottle. And behind the log is my collapsible 1L bottle, which I use for collecting water and as a secondary carrier. 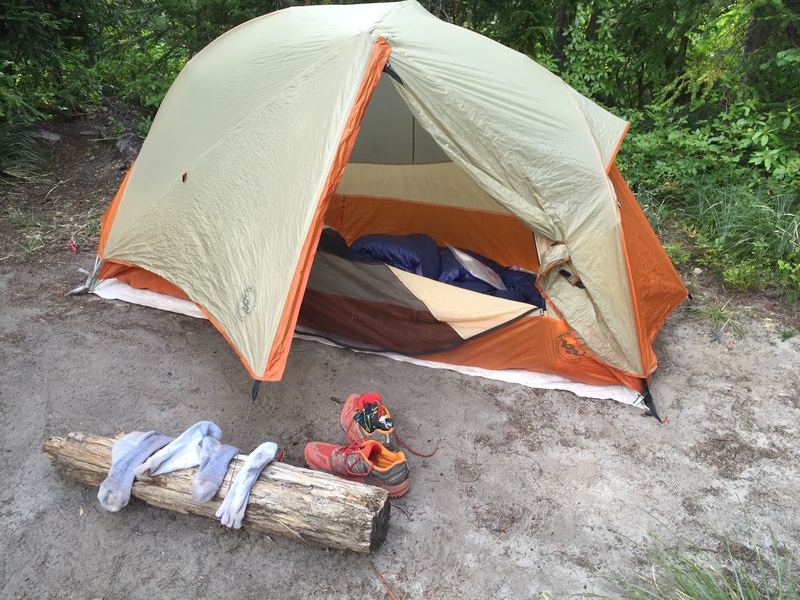 My tent is a Big Agnes Copper Spur one man. You can’t see much else inside, but the blue blob is my backpacking quilt. A quilt is much lighter than a sleeping bag; mine is only 19 oz. The theory behind a quilt is that when you’re in a bag, the insulation under you is squashed, and thus can’t do its job. My quilt attaches to my sleeping pad via two elastic straps, and I sleep directly on my pad. In front of the tent are my trail runners and (rather skanky) socks. Most long distance hikers use trail runners; they are much lighter, and a pound on the feet is equivalent to about five on the back, in terms of energy outlay. I have a history of wobbly ankles, but if anything the trail runners make that less of an issue…I am able to feel what’s going on better than I ever did with boots. Add trekking poles to that mix, and it’s a big win for me. And speaking of trekking poles, here they are, Black Diamond Alpine Carbon Cork. I got these just before I left, to replace my much loved but long-in-the-tooth aluminum poles. The new ones are fantastic. 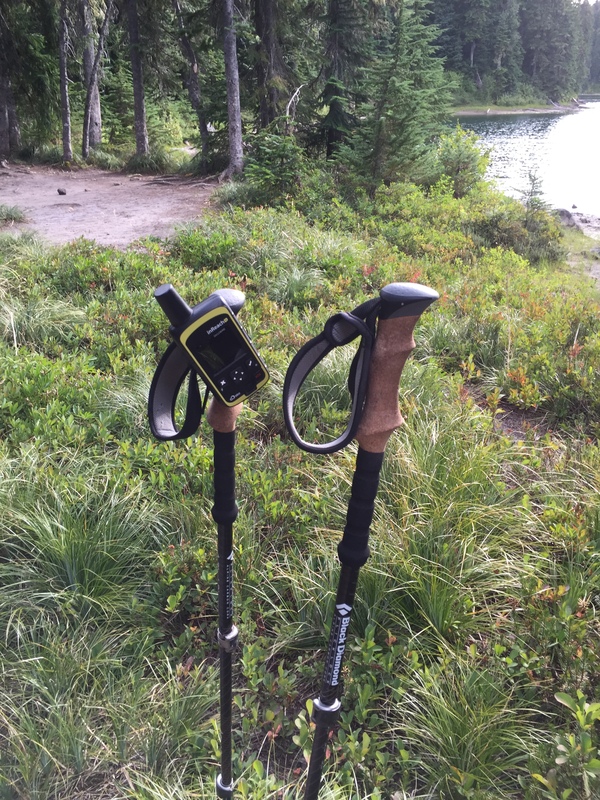 The poles are doing double duty here, holding my Delorme inReach SE satellite communicator. It allows me to text with Steve, get updated weather forecasts, and call Search and Rescue. I love this thing, plain and simple. After I started making dinner, I got a campsite-mate named Elroy. He’s of retirement age, and is a SOBO, from Austin, TX. Apparently I was only the second person he’d shared a campsite with, since he left the border. We had a good chat. His plan is to go to White Pass tomorrow for a resupply, and then head to Trout Lake to pick up some new gear from REI. He’s also hiking on a broken toe, which he claims is more numb than anything else. I wish him all the best. So far my leg is only having the occasional twinge. I am very pleased, needless to say. I’m sleeping in tomorrow, since I’m only going about nine miles. We were singularly unimpressed with the docs in Yakima, so after breakfast, we headed off to our urgent care. The doc on duty was a former section hiker, so he completely got how upset and worried I was. I just wanted to know what it would take to get me back out to the mountains. His first thought was a stress fracture, but when he saw the pictures I took on Thursday night, with the very painful swelling and the redness and heat, he changed his diagnosis to cellulitis. I got an enormous shot of heavy duty antibiotics, a full course of more antibiotics, a follow-up appointment in five days, and the possibility of returning to the trail! I hobbled my way back to the car, and we headed home. I was to keep my leg iced and elevated at all times, take those antibiotics religiously, and keep using the crutches. Well, that’s what I did. It was too painful to put any weight on it until midday Monday; it was so swollen it felt like my skin was about to explode. I read books, and played a lot of Mahjongg, all the while trying not to think about having to cancel my trip. …and got clearance to go!!!!! My plan was to keep icing and elevating until we left on Saturday. I also had to do short days between White and Chinook Passes, set bailout routes every ten miles, reevaluate at Chinook, and set bailouts between Chinook and Snoqualmie Pass every twenty miles. The requirements were met, the bailout plan was in place, the pack was ready to go, and I hit the rack on Friday, August 7, beyond excited for my return. Steve showed up first thing this morning, and bless his fuzzy little heart, he brought two enormous boxes of Top Pot donuts for all the hikers to share. Score! Then we headed off to Yakima, to find an urgent care. The decent looking one refused to see me, because we didn’t have an appointment. The rinky-dink small town one did see me, and told me that I either had tendinitis or a stress fracture. They handed me some crutches and sent me home. No notice at all of the red, hot, swollen nature of my leg. Sigh. Needless to say, I was rather dismayed by this turn of events, and it was a hard trip home. But I was totally pampered when I arrived, and spent the afternoon and evening on the couch. I got up at 5. Today’s goal, of course, was the Kracker Barrel, 13 miles and 2000 feet; my resupply box was there, and they closed in the late afternoon. I had to hit the trail early, as I knew I’d be in pain all the way. My leg was *really* beginning to hurt. Well, actually, it has been hurting, since the second day. It’s my foot, ankle, and lower leg, getting worse. And worse. And worse. But my only choice has been to hike 40 miles on a bad leg. 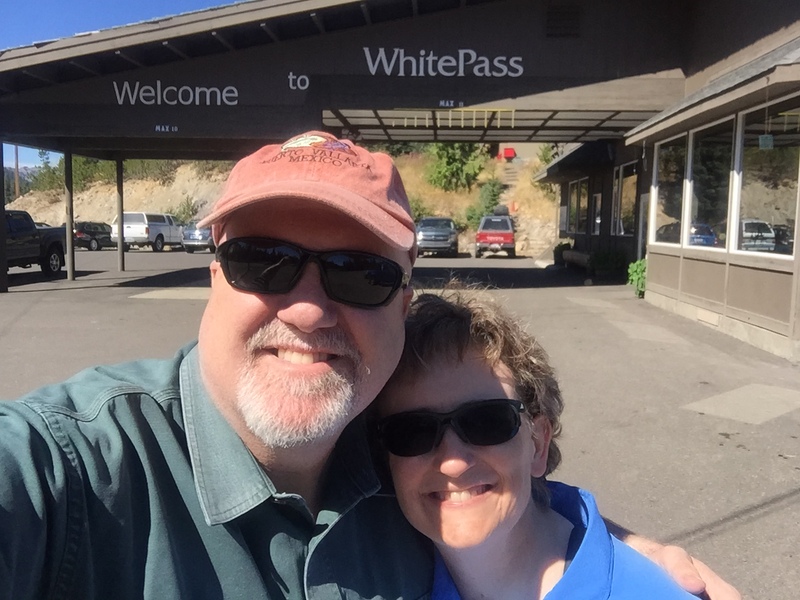 It was time to quit my complaining, and head for White Pass. I refilled at the spring, which was maybe a quarter mile off trail, and I was off. It was a long day, but not without its eye candy. The trail went generally up, until the junction with the Shoe Lake Trail. I met the group of retirees there while I was having a snack break. They were going to take the alternate loop down to Shoe Lake. 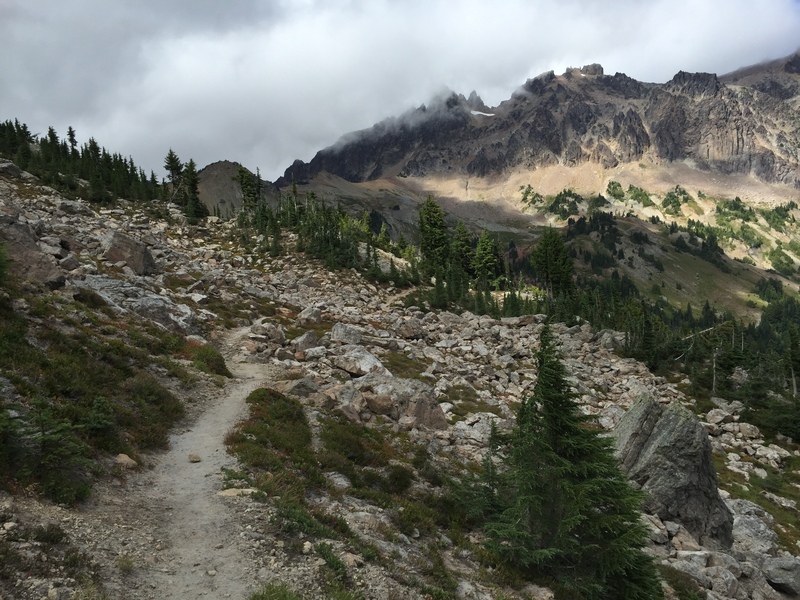 I stuck to the main PCT; there was a large talus slope, but after that the views were amazing. We met again at the junction, crested the ridge, and then traversed a stunning basin around Hogback Mountain and Hogback Ridge. Mt. Rainier showed her head above the ridge, and behind us was a beautiful view of the Goat Rocks. Alas, with my reduced speed, they were soon out of sight. The trail began a long descent to Ginette Lake, where I grabbed a liter, and then switchbacked down to White Pass. From the pass itself, it’s a half mile road walk west to the Kracker Barrel, home to resupply boxes, convenience store foods, a little bit of a menu, and all kinds of general goodness. I arrived about 4, only a little later than I thought I’d be. My plan was to grab my resupply box and hit the trail. But I decided the heck with it: I’m going to get a room at the lodge, resupply, sleep late, and regroup in the morning. So I’ve got a nice Motel-6-esque room with kitchenette, which as far as I’m concerned is the Taj Mahal. I exploded my pack (yes, that is a phrase), and headed down to pick up my resupply. My first resupply box. Best part? More Snickers. And then, FOOD! For the record, that sandwich was huge. I took the last bit of my dinner, went out, and camped on the bench along the front of the store. It’s the hiker hangout, and I got to chatting with a girl (whose name I can’t remember). Turns out she has shin splints, and was going to skip a SOBO section to head to Trout Lake. She’s getting compression sleeves, and is the second person who is using those for shin splints (Casey Burt being the other one). We compared symptoms, and at this juncture it looks like it could be a leading candidate for me. It’s certainly not an uncommon injury among long distance hikers. Anyway, Steve will be bringing compression sleeves up with the Chinook Pass resupply (THANK YOU). I’ve been having a great time at the Kracker Barrel so far; lots of giggles over this, that, and the other thing. Far more so than last year, I feel part of a community. And that’s good, because that’s one of the things I’ve been hoping to find. My goal today was to head over Cispus Pass, and around to the other side of the Cispus River drainage. I want to position myself for tomorrow, by camping near the last water supply until after the Knife’s Edge. Backpacking is like that: some days it’s all about positioning yourself for the next day (or the next, or the next). Once again, I played leapfrog with the Scouts. I think the boys are beginning to warm up to me. 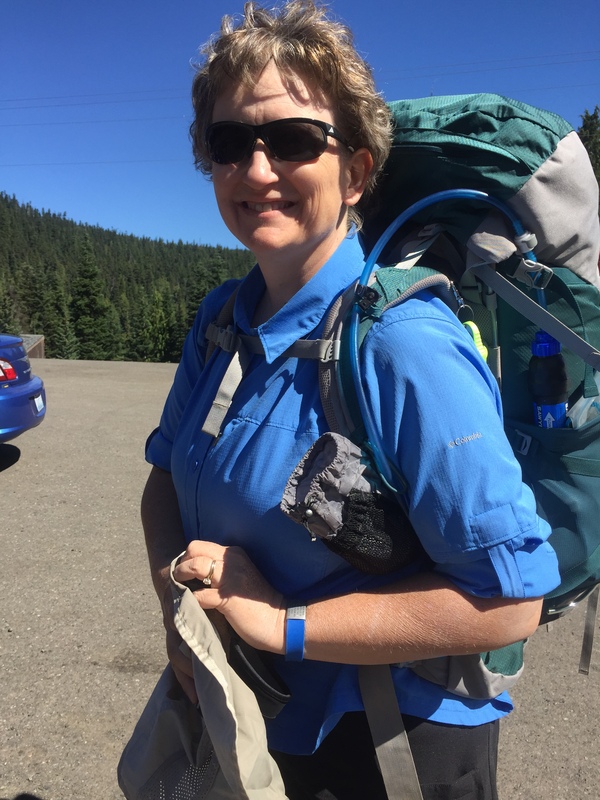 I suppose being a woman backpacking solo is something they haven’t seen much. I’d like to make it a little more commonplace. I was going slow today, as I’ve got something going on with my left ankle. Either that, or it’s my lower shin. I’m praying it will work out. So I’m doing the ice/ibuprofen thing, and elevating at night by putting my pack under the foot of my sleep pad. 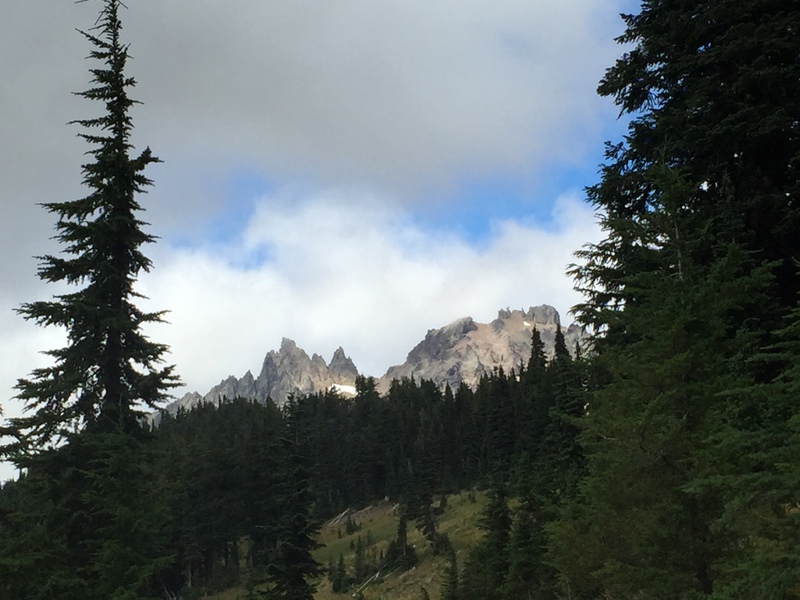 I instantly forgot about my pesky ankle midafternoon, when I looked up and got my first eyeful of the Goat Rocks. I did make it over Cispus Pass, although with the ankle thing I was going pretty slowly. It’s absolutely gorgeous up there. 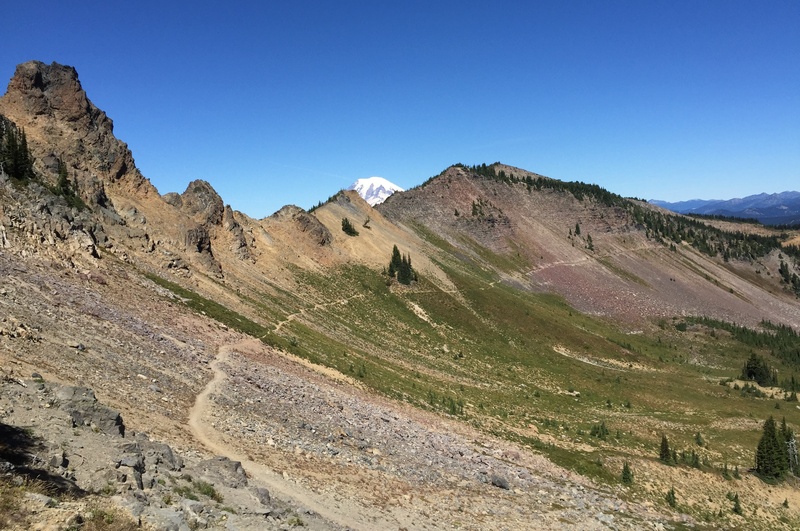 The Goat Rocks area is an extinct volcano, so it’s got a different look than, say, the granite of the North Cascades. On the runup to Cispus Pass, the right side of the trail is Yakama tribal lands; they request that you stay on trail at all times. The whole area is just mind-numbingly beautiful, and I could have stayed for hours. But it was getting late, and I needed to grab some water and set up camp, on the opposite side of the river drainage. On the opposite side were a couple of smaller tributaries; I camped shortly after the second one. Tomorrow, the Knife’s Edge!